We were all put to work in the hold. Just a little more to do tomorrow at Signy as the ice in the night slowed us down so we didn’t get here until 11am. Most of the cargo is aboard and the station compliment of 5 are staying ashore tonight and will come aboard with their personal stuff tomorrow. It was a gray wind wet day today but fun to get ashore and look around the station. It is pretty small and it is a summer only base. They do a lot of penguin science and some moss/lichen. We got to see something pretty similar to grass. The station is surrounded by elephant seals and they pretty much stink the place out. There are about 20,000 fur seals on the island as well all running around the place – a lot were juveniles. The landing craft full on its way back to the Shack. So back aboard now after moving lots of cargo and time to eat dinner and maybe watch a movie. For more info on the station click here. Tomorrow we will move on towards King Edward Point which is the BAS station at South Georgia where relief is set to take two days. Last night we loaded cargo and people on at Jubany in the south shetland islands and are now 20 hours away from Signy on the south orkney islands. Jubany is one of the three stations in Antarctica that has a dive chamber so last night I was talking to one of the scientists about the diving there. They do pretty limited diving this season collecting sediment cores from 30m. The station was a large collection of small red buildings with a large rock outcrop (a very miny table mountain) behind. Off to the left was a patch that was slightly green – maybe grass? Only 4 FIDS got to go ashore to help with cargo. The rest of us watched as they launched the small tiller steered Humber and the large landing craft. The snow had stopped so we did have a good view of the station and it was a lot less windy then our stop at Deception Island. The wind is behind us now as we rock and roll towards Signy at 12.5 knots. I must go off to the gym to work off all the amazing food that gets laid in front of us everyday onboard. I will be on Gash on thursday. We continue North on the Shack. Unfortunately the visiblity was really poor on the way up the Peninsula so we missed all the amazing views. 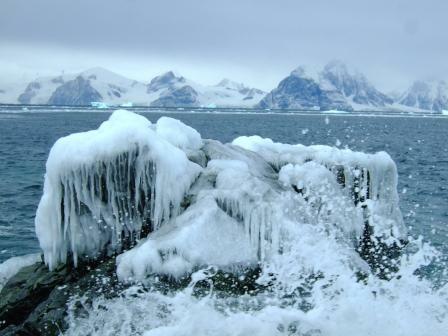 The Lemaire Channel was a white out as was Port Lockroy. Shame but as I said to everyone at least we hadn’t paid a lot for a cruise and seen nothing! This morning at 7am we were in Whalers Cove at Deception Island. The plan was to launch the small boats and go for a look around the derelict British Base that was closed after the eruption in 1967. Followed by a swim in the cove where the volcanoe vents heat up the water. Unfortunately it was blowing 50 knots when we went through Neptunes Bellows into the caldera. So after a slow cruise around seeing the Spanish and Argentine Bases which are still used as summer only we headed back out to sea for a 6 hour passage to Jubany. We are loading on people and cargo at Jubany (German base) this afternoon/night. Then we will move on to South Georgia and the British base of KEP which is where BAS have offered me a job starting in December for a year. At 9:45am fiveteen minutes late the gangplank was pulled up and the Shackleton started to cast of the mooring lines. From 7:30am last minute loading had been going on down at the wharf. We were late because Chef Nicola had slept through her alarm but someone noticed she wasn’t on the ship so she was woken up and quickly made her way aboard. As the lines were being removed from shore one of the 25 FIDS asked if I had seen Dave – I said no and asked a few others. Then I asked the Base Commander who asked the WBC (winter base commander) who was still on the wharf. The WBC said he had seen him at work at the wharf so he must be onboard. Dave woke up to the sound of the ships horn as it steamed away from the 22 winters standing at the wharf in the snow. They were setting off parachute flares, red hand flares, smoke flares it was like a massive firework display. The problem was that Dave was still in his bed in Admirals! When he walked out onto the veranda one of the winters said – ‘you aren’t meant to be here’… The Shack did a hand break turn and returned to Biscoe Wharf to pick up Dave who had neither planned on nor wanted to winter! He was loaded on along with his bags up the pilot ladder. It was so cold and the visibility was so poor no one hung around long on deck to see the point disappear in the snow flurries. There were some wet eyes amongst the 45 people lining either the wharf or the side of the ship. Three on the wharf were about to embark on their second consecutive winters which is the maximum BAS will allow without going home. I had a two day hand over to Andy the boatman however, it was relatively easy seeing as he did two consecutive winters during 2003-2005. The number of boats has decreased from nine during his tenure to two this time as three were removed from service this summer and one is on the Shack coming home to be refurbished. So not only an emotional farewell to Rothera now fully into the winter season but also an exciting one! We are at 65S heading north at 13.6 knots. It was an exciting and emotional farewell with the 22 people remaining on base setting off flares like it was the 4th of July. First stop is Jubany the German Base to pick up a few people. Seas are relatively flat but the Shacks hull shape means she is moving around a lot – kind of like being in a washing machine cycle! The snow was still coming down thick this morning at 7:30am. The guys at the wharf were hard at work unloading the ship. But had time to let Mel get in the drivers seat of the JCB. I am going to have a go tomorrow. 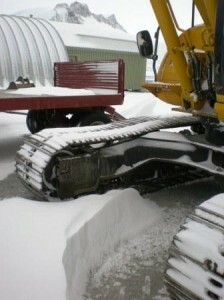 The stuff from station will load on tomorrow and then the winters will eat on the ship tomorrow night. While they are on the ship it is traditional for those leaving to play pranks – one year the boatmen came back to find a boat in his room which had been deflated and reinflated! We cast off from the wharf on Saturday. This is a picture of the salt water freezing on Cheshire. Pretty cold here at the moment -23C wind chill blowing 36 knots from the south. The ship arrived in at 1pm today and relief has started with winter stores being unloaded and garbage, personal boxes etc being loaded on to go north. We leave on Saturday so 2 more days on base for me. I will be sad to leave my ‘home’ of the last 5 months and all the friends that are staying behind for the winter. It is however, sure to be a great cruise home even if there are very large seas! Apparently no one was allowed on deck or in the cargo holds on the way south as there was such a large sea state. To many things to do this Saturday has come very very quickly. The ship brought me another wedding invitation with my mail and a beautiful colorful card from Sutter which everyone admired. Pictures of flowers are very much in demand even the boys like them! Today was my last proper day in the shed as the Shackleton arrives tomorrow and I have to do a two day handover to the wintering boating officer. 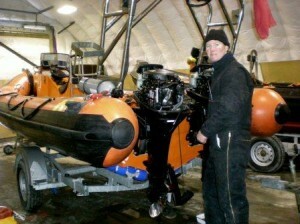 So here I am removing the engines from Erebus who is coming north with us for some TLC in the UK at Humber. This is a picture of the remaining summer Bonner Team. Mel and myself in the dive suits, JJ the lone male, then Sian and Amber from Edinburgh Uni doing PHD’s, Terri the marine assistant (going into her second winter down here) and Colette the new marine biologist taking over from Mel. Today was my last dive down south. It was blowing in the morning from the south and although it was only 20 knots it was bouncing up against the wharf so it wasn’t prudent to launch the boat. Luckily after 3:30 it started to abate so we went out for what is most likely Mel and I’s last dive down south with base commander John Withers driving the boat and JJ dive officer supervising. We went for a ”biosurvey dive” as we are not allowed to recreationally dive down here. 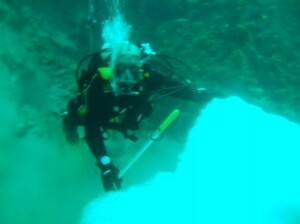 With a large low pressure sitting over us our no deco time at 24m was only 20 minutes but it was an amazing dive. We dropped in at Anchorage on the wall – the visibility was stunning and the wall is full of life. We came across a pretty denuded gulley with a submerged iceberg which was really cool. 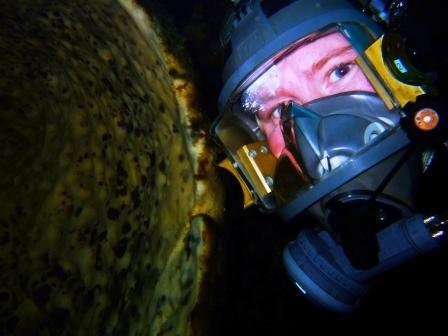 Then at 19m we found the sponge that everyone talks about. It is so large you can stick your head inside of it. 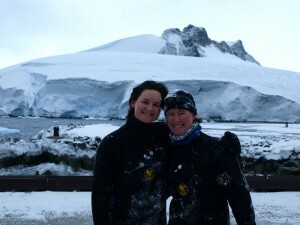 When we got to our safety stop at 6m there was a penguin who came swimming around us underwater. It was very curious and had a good look at Mel. Although a short dive I did get one very cold finger however, not cold enough to go looking for the Humpbacks that went swimming by while we were underwater. So basically a pretty epic dive to finish on! On Sunday afternoon I dragged Cheese (real name Iain) up the hill despite -8C and 20 knots of wind. He then dragged me up Pink Moon which is an ice climb that took almost three pitches to get to the ridge of Middle Stork. By the time we got to the top it was 7:10pm and the sun was setting at 7:45pm. It was snowing hard and Iain gotee and mustache were well iced up! The visibility was OK although it was snowing when we got to a little windscoop where we took off our glacial travel coils. Cheese then headed up the sloop putting in ice screws which I belayed him. Once he got about 50m away he put in two ice screws and anchored himself to it and belayed me up the 1st pitch. We swapped places and he took off again with me belaying him. He had to go across the slope first before heading up so he wasn’t able to see how much rope was left and my voice was carried away by the strong wind which was blowing snow all around. The visibility closed down very quickly so that we could hardly see the skidoo below us and eventually it dissappeared altogether. I removed all the anchor screws and belay and started climbing to stay with Cheese so that he could find another place to anchor himself and wait for me at the end of the pitch. The horizontal climb was actually quite hard work and nerve racking with the ice being so brittle under a layer of soft powder. It was hard work to get a good grip for the ice axe and hammer. About 30 meters from the end when Cheese was standing on the ridge out of view my crampon fell off my left boot. So what was a hard ice climb became even harder! I yelled up at Cheese but the wind made it impossible for him to hear. The visibility drew in more and it started to get dark. So I did what we do in the marine team and ‘manned the f*** up’ as there was nothing he could do as even if we had a spare crampon I was on a 80% slope so I wouldn’t have been able to fit it! I then proceeded to step up with my right boot digging the front points of the one crampon in and then cut a step with my ice axe for my left foot. Needless to say it took a while. Once on the ridge we called back to base on 18 told them we would be an extra 30 minutes past out original ETA and that all was well. Seeing as Cheese had not done Stork Ridge before and didn’t know where the crevasses were and the contrast was so poor I led the way. We were again roped up for glacial travel. We crossed the crevasse I knew about from when Adam fell into it at the beginning of the summer. I could then see two hollows in the snow just before Stork Bowl and found there were two more crevasses that had opened up. My right crampon was holding me and I was half skiing with my left boot sans crampon down into Stork Bowl. To get out of the Bowl you have to climb up over a little cornice and then it was a short trot back to the skidoo. Sunday dinner which we were late for and was put to one side for us was delicous then it was time for early bed as I was exhausted! 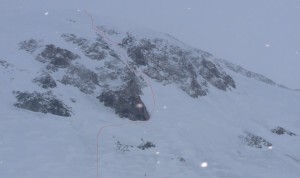 The red line is the route up the bottom part of Middle Stork.